Vroom, vroom - the Wheelcity cars welcome you! Get ready for the fun, action-packed car cartoons for toddlers and kids! Meet fast Flash The Police Car, helpful Hook The Tow Truck, strong Red The Fire Truck, and charming Lila The Ambulance! Many adventures and many other cars like race cars, dump trucks and more await you in these vibrant, exciting and educational car cartoons for kids! Learning is way more fun when big wheels and revving engines are involved. 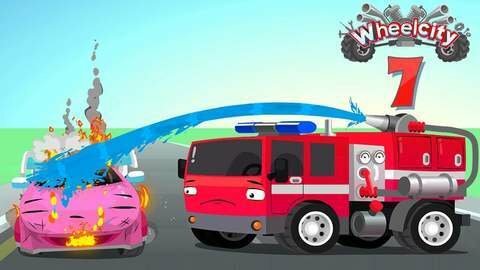 Learn moral lessons about helping out, about different automobiles and their uses in this educational collection of online car cartoons about Wheelcity. Find out how the vehicles help each other out and learn to avoid future accidents. Head over SeeZisKids today if you'd like to see more free cartoons for boys and girls online.